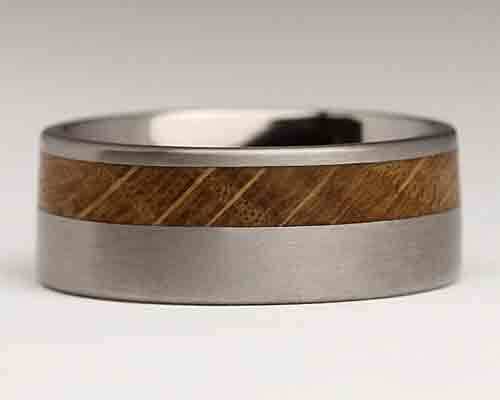 Men's Titanium Wedding Ring With Wood Inlay : LOVE2HAVE in the UK! 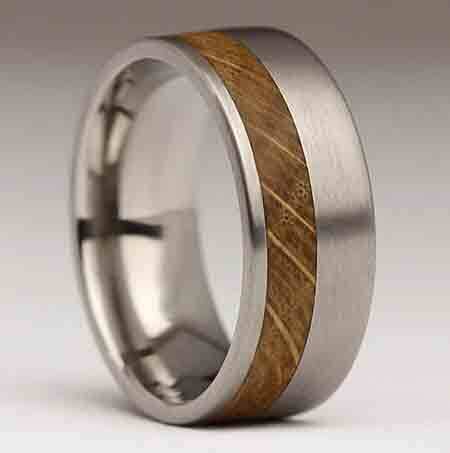 A men's titanium and wooden wedding ring. Our offset inlaid men's rings are popular for customers looking for an inlaid men's wedding ring with that extra bit of designer styling. We decided to feature a wood version made in titanium for this very reason and here is a flat profile titanium ring set with an Oak inlay towards one edge of the ring. It measures 9mm in width, and the offset wooden inlay is 3.5mm wide. This handmade ring features authentic rustic styling just like all the other rings in this section and would make a lovely choice for an alternative wedding ring for men. We also sell a narrower version too, which when purchased together create a beautiful wooden wedding ring set. The titanium is matte in finish, and the inner is curved and therefore very comfortable. A lovely rustic ring with a wooden inlay and your first choice for a wooden wedding ring.